The 3rd Graders at our school did a performance of songs from Seussical the Musical and dressed like characters from Dr. Seuss books. 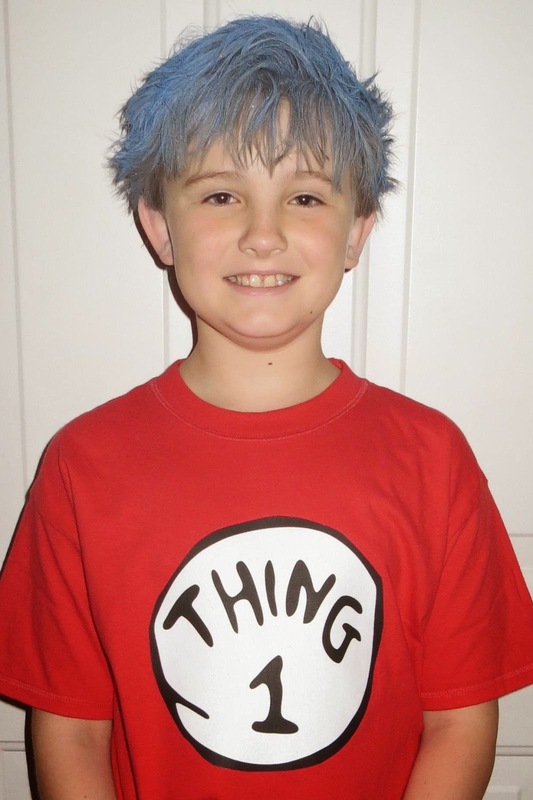 My son wanted to be Thing 1. I used gel and blue hair spray (found at Walmart but have seen at Party City too) to do this crazy hair. Then, I created a shirt for him using a plain red t-shirt and fabric transfer paper for dark colors (found at Walmart but have seen at Michael's & Hobby Lobby too). I found a Thing 1 clipart image online, copied it into a blank Word document, and then sized it to be as wide as the paper. Print the image onto the transfer paper and follow the instructions for ironing it onto the t-shirt. I had never used fabric transfer paper before but it was really easy to do by following the enclosed instructions. Isn't he a cute Thing 1?